Tiny breast tumours are difficult for surgeons to find and remove during surgery. 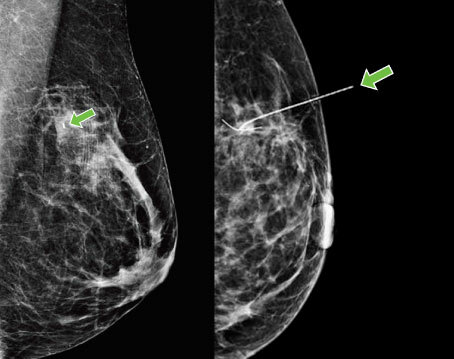 For years, the only way to do it was to insert a wire (known as a harpoon) into the breast to mark the tumour during pre-surgical imaging. But the wire was uncomfortable and sometimes shifted. Today, a tiny radioactive seed is implanted instead, making it easier for surgeons to find and fully remove the cancer. Dr. Carolyn Nessim and her colleagues recently conducted the first cost-comparison of the two procedures in a public health system. They found that the average cost per patient was $251 for the seed procedure, compared to $1130 for the wire system. Patients also waited less on the day of their surgery – an average of two hours for the seeds versus four hours for the wire. This research was published in Annals of Surgical Oncology and received the Scientific Impact Award at the American Society of Breast Surgeons Annual Meeting. Learn more about radioactive seeds for breast cancer surgery and watch a video featuring Dr. Nessim and Dr. Erin Cordeiro. Authors: Zhang Y, Seely J, Cordeiro E, Hefler J, Thavorn K, Mahajan M, Domina S, Aro J, Ibrahim AM, Arnaout A, Gravel D, Nessim C.
Funders: This study did not have any dedicated funding. Research at The Ottawa Hospital depends on generous donations from the community to the hospital.